TORONTO, Oct. 9, 2018 /CNW/ - Aethon Minerals Corp. (TSX-V: AET), ("Aethon" or the "Company") is pleased to announce drill results from the Company's initial eight hole drill program at the Llanos De Llahuin project ("Llanos" or the "Project"), located approximately 250 km north of Santiago in Chile, and a change in its year end. The 2018 maiden drill program at Llanos consists of eight diamond drill holes totaling 1,417 metres. The shallow drilling program tested 700 metres of strike length to depths of up to 200 metres below surface. All of the drill holes targeted in the alteration zone were successful in intersecting copper and gold mineralization related to quartz veining over narrow thicknesses within a broad (up to 300 metres wide) zone of intense alteration. The drilling intersected pervasive, disseminated pyrite mineralization within the quartz-chlorite-sericite alteration zone, which could grade downwards into a potassic alteration zone with associated, higher grade copper-gold mineralization. 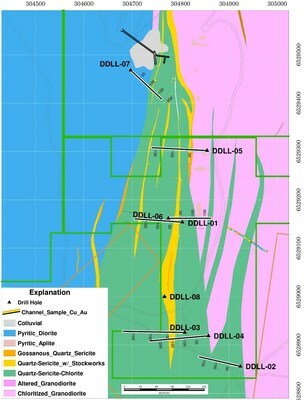 A suite of core samples has been submitted for petrographic study to determine the possibility of a deeper copper-gold mineralized porphyry system. Robert Davies, President and CEO of Aethon, commented, "We are encouraged by the results of our first drill program at Llanos despite not intersecting widths that would be consistent of a porphyry system. We are continuing to assess these results and have commenced a petrographic study of the area in order to evaluate our next steps regarding the Project. Several areas at Llanos with anomalous near-surface copper and gold values and promising geophysical results have yet to be drilled. A suite of core samples from the quartz-chlorite-sericite alteration zone drilled at Llanos has been submitted for petrographic study to determine the possibility of a deeper copper-gold mineralized porphyry system. A second, deeper drilling program may be designed to test this possibility." 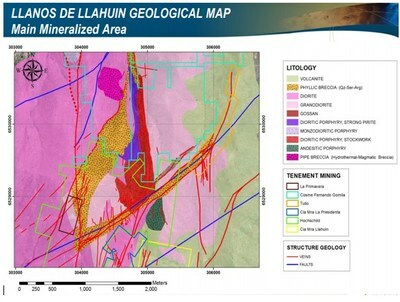 The Llanos project is ideally situated in between the Llahuin cluster of copper porphyry bodies (70% optionee Hudbay Minerals Inc. / 30% Southern Hemisphere Mining Ltd.), and the El Espino IOCG project (100% Pucobre [Sociedad Punta del Cobre S.A.]). Pervasively quartz-sericite-chlorite altered dioritic-granodioritic intrusive rocks at Llanos contain abundant disseminated pyrite mineralization, with quartz veining and veinlets hosting variable chalcopyrite and gold mineralization, (see Figure 1). Surface geology and geochemistry include gossanous outcrops with anomalous copper, gold and molybdenum values suggestive of porphyry style mineralization. These were the main drill target at Llanos. Widespread quartz and quartz-magnetite veins and breccia zones have been and are being mined across the Llanos area, (see Figure 2). These copper-gold bearing vein systems are a secondary target that are scheduled for exploration by Aethon at a later date. 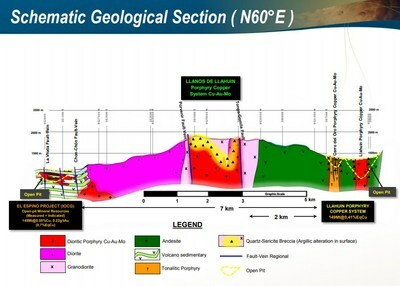 The quartz-sericite alteration zone intersected by drilling at Llanos is several hundred metres (500-700) higher in altitude than the copper-gold mineralization at the adjacent Llahuin porphyries and the El Espino IOCG deposit, (see Figures 3 and 4). If the Llanos mineralization is genetically related to the adjacent systems, the alteration intersected by drilling at Llanos could be several hundred metres above a more prospective potassic alteration zone. As announced on May 16, 2018, Aethon entered into an option agreement to acquire a 100% interest in the Llanos Project. The upfront initial payment was US$100,000 with total option payments allocated over 4 years totaling US$6.3 million. The Company is evaluating the results of the initial exploration program in order to determine next steps. All sample assay results have been independently monitored through a quality control/quality assurance ("QA/QC") program including the insertion of a blind standard and blank every 20 samples. Logging and sampling are completed at a secure facility located at Llahuin, adjacent to the project area. Drill core is sawn in half on site and half drill-core samples are bagged and securely transported to the ALS sample preparation facility in La Serena, Chile. All samples are analyzed for gold by standard 30-gram fire-assaying with ICP (Inductively Coupled Plasma) or gravimetric finish. Other elements, including copper, are analyzed using four-acid ICP-AES (Inductively Coupled Plasma Atomic Emission Spectroscopy) method. Samples that exceed 1% copper are re-analyzed by four-acid ICP-AES optimized for high grades. The technical information in this news release was reviewed and approved by Michael Schuler, P.Geo. AIPG - CPG11559, independent consultant to the Company who is the Qualified Person as defined by National Instrument 43-101. Aethon Minerals is a mineral exploration company focused on creating value in the base metal space with an emphasis on copper mineral assets in Chile. The Company has consolidated a very large prospective land position consisting of over 130,000 hectares along prolific mining belts located in the Antofagasta and Maricunga regions of northern Chile. 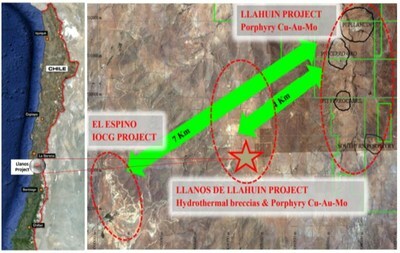 The Company also has an option agreement to acquire a 100% interest in the highly prospective Llanos De Llahuin project situated in a region with excellent access and existing infrastructure. Aethon believes it is uniquely positioned for growth and is actively pursuing selective copper-focused growth opportunities. Aethon is based in Toronto, Canada, and is listed on the TSX-V under the symbol "AET". This news release may contain forward-looking information, such as statements regarding estimates, expectations, future plans and objectives of the Company, exploration and future drilling plans for the Project and is subject to a variety of risks and uncertainties and other factors that could cause actual events or results to differ materially from those projected in the forward-looking information, including risks relating to the ability to complete the Company's obligations under an option agreement to earn a 100% interest in the Project. Statements or information in this news release which are not purely historical are forward-looking, including any statements regarding beliefs, plans, expectations or intentions regarding the future. Forward-looking information is based on the opinions and estimates of management at the date the information is given, and is subject to a variety of risks and uncertainties and other factors that could cause actual events or results to differ materially from those projected in the forward-looking information. The forward-looking information contained herein is given as of the date hereof and the Company assumes no responsibility to update or revise such information to reflect new events or circumstances, except as required by law. Additional information identifying risks and uncertainties is contained in the Company's filings with the Canadian securities regulators which filings are available at www.sedar.com.